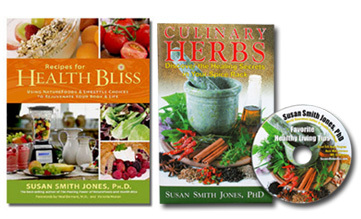 Recipes for Health Bliss by Susan Smith Jones, Ph.D. + FREE Culinary Herbs Booklet With CD - Penn Herb Co. Ltd.
Dr. Susan Smith Jones shares the secrets for preparing fast, irresistible, nutrient-rich meals, snacks and desserts even your family will love. And don't worry if you're not a cook, the dishes are simple and use ingredients easily found at your farmer's market, natural-food store, or any large supermarket. Gift Bonus: Culinary Herbs - Discover the Healing Secrets in Your Spice Rack booklet - The nutrients and antioxidants in common kitchen spices have the potential to fight cancer, diabetes, and Alzheimer's. Discover the health benefits of cumin, cloves, fennel, nutmeg, turmeric, oregano and other popular spices!